Here’s a snip from an email newsletter from Simple Shows. The “dear fellow polluters” subject line caught my eye. It’s worth noting that Simple is a division of Deckers Outdoor Corporation, a California corporation with $264 million in revenue. This kind of puts the whole “a nice little shoe company” conceit in a new light. As does Deckers’ corporate mission. Our mission is to build niche footwear lines into global brands with market leadership positions. None of which, of necessity, takes away from the authenticity of their Simple Shoes message. But it does make we wonder how deep their thinking goes, and how much of it is simply brand posturing. Written January 30, 2007 at 2:42 p.m.
How many Simple shoe wearers would go looking for a less multinational shoe, but for romantic mistaken ideas about Simple being uninvolved in free trade, private enterprise and cheap labor? Most of them maybe. Anyway, they’d still end up buying corporate shoes. Advertisers are allowed to spread all kind of romantic balderdash. I was under the impression that I was buying my shoes from a small private company — how naive. Funny, I thought we wanted more eco-friendly gestures from big corporations. Is Decker not *cool* or *hip* enough to front the eco-friendly thang? Do ppl still use the words *cool* and *hip*? Am I not *down* anymore? 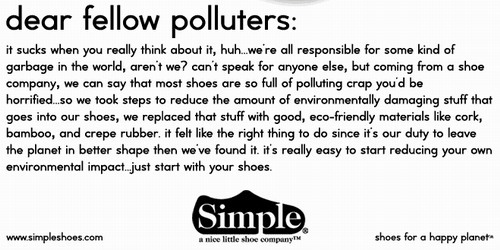 they’re shoes… which contain less environmentally damaging materials.. I say huzzah to Simple!